Today, Photoshop and other photo editing tools are used extensively for everything from digitally slimming swimsuit models to retouching school photographs in an effort to erase the memories of adolescent acne. But some photo retouching has a rather more nefarious purpose: swaying viewers to one side or the other of a political debate. This practice is not a strictly modern one, though: people have been altering photographs for political purposes almost since the day photographs were invented. These political photo hacks date all the way back to the 19th century and continue up through the present day…because no one ever accused politicians (or their staff, followers or enemies) of being too honest. Abraham Lincoln is one of the most celebrated former American presidents, and this stately portrait of him standing in a rather regal pose has graced countless classrooms. 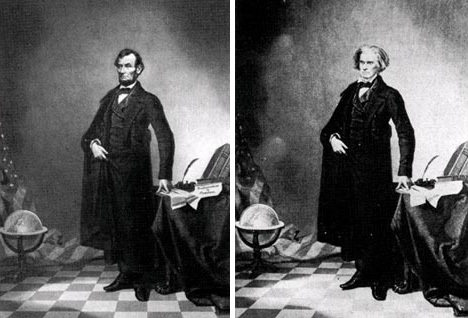 But the truth is that Lincoln never posed for this picture; rather, it is Abe’s head (from a less-regal seated portrait) pasted onto the body of Southern politician John Calhoun. If you look very closely, you can see that the words on the papers have been changed from “the sovereignty of the states,” “strict constitution,” and “free trade” in the Calhoun photo to “union,” “constitution,” and “proclamation of freedom” in Lincoln’s. Another iconic American history photograph is this one of General Ulysses S. Grant on horseback before his troops in City Point, Virginia during the Civil War. It’s a wonderful and oft-circulated piece of history…and it’s also a total fabrication. 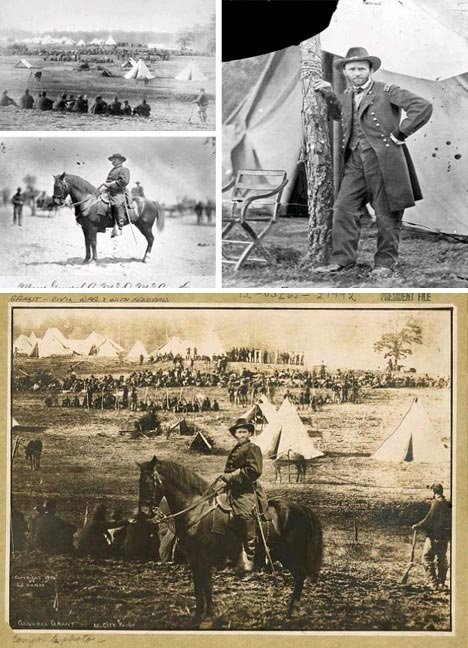 The portrait, bottom, is actually a composite of the three images above it: General Grant’s head on the body (and horse) of General Alexander McCook with a backdrop of a battle at Fisher’s Hill, Virginia. In this 1942 portrait of Benito Mussolini, the horse handler holding the steed’s reins was thought to detract from the power and authority that the Italian Fascist wanted to portray. Therefore, Mussolini had him summarily dismissed from the photo after the fact. It’s rough falling out of favor with a political leader – particularly one who employs skilled photo editors to erase all photographic evidence of enemies’ existence. In all of these photos, a former friend, colleague or adviser was deemed unsavory after the photos were taken and subsequently edited out of the images. 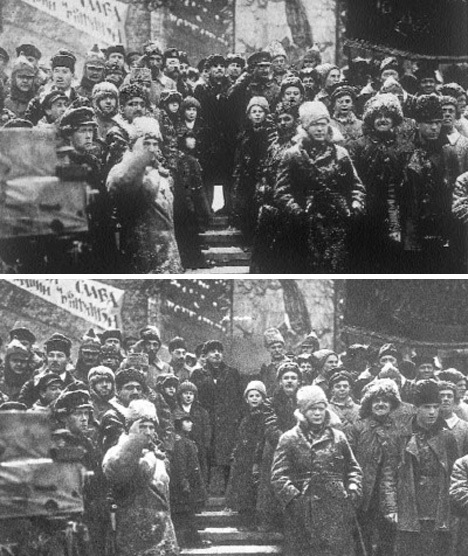 Top: a commissar is removed from a photo where he once walked alongside Josef Stalin. 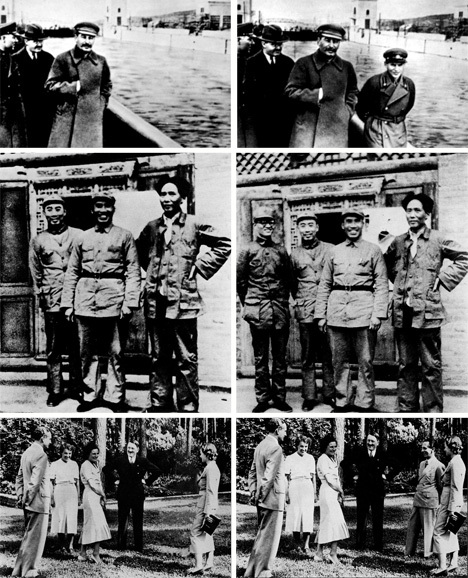 Middle: once Po Ku fell out of favor with Mao Zedong, Mao had him erased from this photograph. Bottom: Joseph Goebbels was one of Hitler’s closest advisers and a high-ranking Nazi official. Although his career experienced ups and downs, he never truly fell out of favor with Hitler, which is why it is puzzling that he was removed from this 1937 photograph. Likewise, Leon Trotsky (along with two other men) and Carlos Franqui suffered photographic deaths after publicly opposing the policies of Josef Stalin and Fidel Castro, respectively. In 1950, with America in the midst of the Cold War and anti-Communist sentiment running hot, this apparent meeting between Senator Millard Tydings and Earl Browder, the head of the American Communist Party, was instrumental in Tydings’ unsuccessful senate bid. It was a fake cooked up by the staff of Senator Joseph McCarthy after Tydings insisted that the American government was not swarming with closet Communists, contrary to what McCarthy alleged. 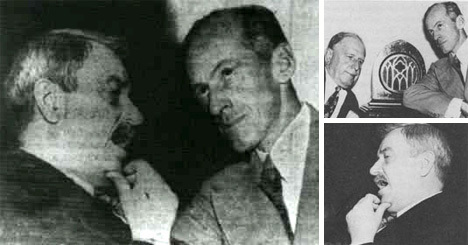 Even though the photo was admitted as a fake, Tydings lost his 1950 election and his made-up Communist ties were thought to be at least partly to blame. During the 2004 presidential election, pictures surfaced of both George W. Bush and John Kerry in compromising positions. 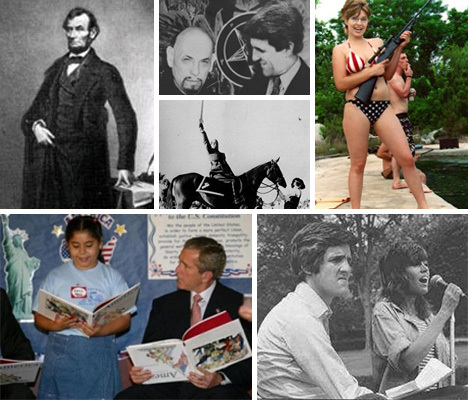 Bush was depicted as stupid and child-like, while Kerry was shown keeping company with unsavory characters or participating in activities that encouraged Americans to question his personal beliefs. Among the most memorable: the top picture apparently shows G.W. Bush reading a children’s book upside down, but it was clearly altered from the original image, show to the right. 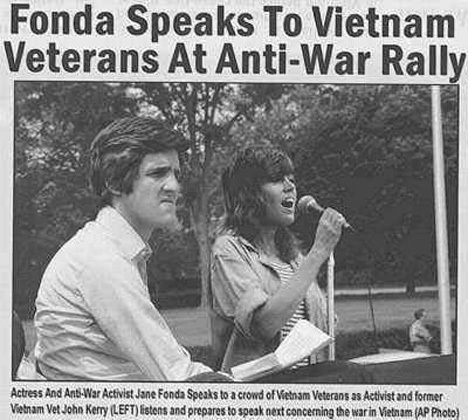 John Kerry was reported to have shared a podium with Jane Fonda at an anti-Vietnam war rally, but the images was later revealed to be a composite of two photographs from two separate events. 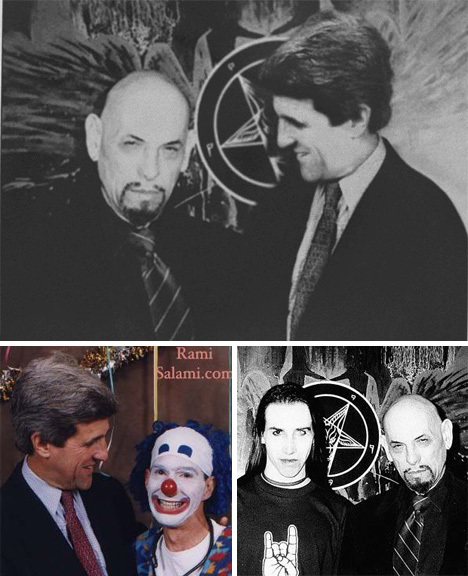 Kerry was also reported to have spent time with Anton LaVey, founder of the Church of Satan, as evidenced by this photo…a photo which was soon uncovered as a fake. The 2008 election was filled with just as much photo trickery. The infamous Sarah Palin photo above, in which the former Governor of Alaska poses in an American flag bikini with a large gun, quickly spread all around the world. It was, however, just as quickly proven to be a fake. Also a topic of discussion during the election was Barack Obama’s pledge to quit smoking, which has proven somewhat troublesome for the politician. This photo of the president with a cigarette in his mouth, however, is not a photographer’s lucky catch of a slip of willpower; it was created by an anonymous internet prankster. In 2009, the director of Spain’s National Intelligence Center, Alberto Saiz, was accused of spending government money on lavish international fishing and hunting vacations. 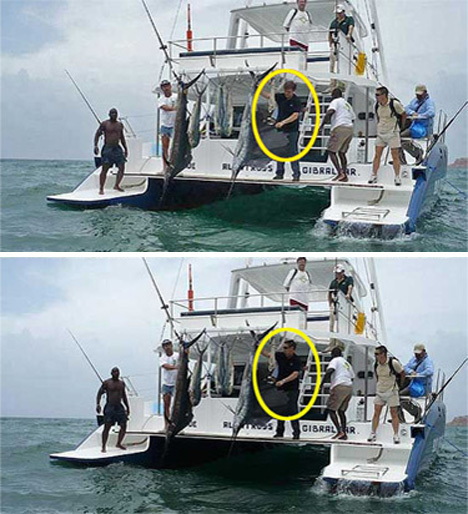 To disprove his presence on a certain fishing trip, Saiz released the bottom photograph above which was supposed to show that he was not present on the fishing boat. The only problem is that when his staff removed Saiz’s head from the photo, they replaced it with that of the man standing just a few feet away from Saiz…in the same photograph.